Buildings have two major classes of systems: Structural and Non structural systems. A structural system by its intrinsic nature, composition, position, or arrangement, provides a whole that stays stable, in equilibrium, or constant (yet may be mobile like a ship, spacecraft etc.). The structural subsystems of a building system must exist in the required location or be available at the required moment and duration to achieve the distinctive constancy. The stability of a building is disturbed, when the structural subsystems are repositioned or removed. Structural systems of a building are conceived for a range of behaviour, of combined profiles of stresses for Tension, Compression, or Torque. Structural systems of the building seem to be well integrated, because by being together they achieve constancy, which is fundamental to a structure’s being. Non structural systems of a building apparently have no or very little role to play in the constancy of the building. Subsystems within a building that do not affect the constancy of a building may be called non-structural systems, such as the partition walls, doors, windows, finishes, etc. Non structural systems though useless in structural sense, are not totally dispensable. Many non-structural systems protect the structural elements, like plaster, walls, claddings etc. Some non=structural systems achieve their own stability by depending or subsisting on the structural systems, such as tensile forms like the stretched net or a sail. Non=structural systems need not be integrated with the structure, so are replaceable or relocatable. 1 Protective systems: Ones that cover the structural systems and non structural systems, e.g. plasters, waterproofing, roofing. 2 Filler systems: Those that fill up the gaps or spaces between structural subsystems, e.g. non load-bearing walls, joints. 3 Independent systems: These are complete systems by themselves that independently provide peculiar functionality, e.g. air conditioning, illumination, communication. ▪ For Length units recognized measures are km / m / mm which may if required must be in small letters. For example architectural plans have nearly all measures in mm, so the mention of mm should be avoided. However, in the same drawing if weight or volume or such other measures are to be indicated, then identifiers for such units may be indicated. Architectural drawings nominally have dimensions of maximum 5 digits (for mm ) unless a detail requires indicating a fraction of a millimetre, signifying measures up to 99999 mm or 99.999 mts (-but unit identifiers are not to be used). Plans larger then 99mts sizes are considered of Map category. ▪ For liquid measure however lt may be written as Lt (to differentiate between 1 and l ). ▪ Point or Full stop for abbreviation may not be used, for example as in m.m. or mm. Natural Woods are many different types, such as Soft, Medium and Hard grain. Woods are likely to be Fresh, Seasoned and Old woods. Woods have different types of faces such as the end grains, flat and side faces. The woods have problems of uneven colours, patterns. The variations in textures are both natural and tools or machine made. For a clear coating application all wood surfaces require surface preparation treatments and post coating application treatments. The surface preparation treatments are over and above the nominal craft processes such as planing, sand papering, etc. These are mainly Filling, Sealing and Staining. The post coating application treatments are not always required, but could be Buffing, burnishing, waxing, etc. Fillers generally consist of an Extender, a Binder and occasionally a Colourant. Fillers are required to fill in the pores in the wood grains of Natural woods and cavities in case of wood products. A levelled surface provides better gloss and integrity of the coating (one continuous surface without breaks). The coating material does not sink into it, and provide an even finish. Transparent fillers (low body NC lacquer, shellac, etc.) are used not only to fill the pores, but provide a sealing coat to the decayable material in the grains and vessels filled with gum exudates. Extenders are low opacity -reflectivity, fine grade powder of materials like gypsum, chalk, china clay, precipitated calcium carbonate, lime, asbestine, colloidal silica, barytes and talc(unlike the Zinc oxide or Titanium dioxide -the white pigments that adds whiteness and opacity). Binders are binding agents that hold together the extenders, temporarily or permanently, and also bind the extenders to the wood substrate. A binder could be water, gums, oils, alkyds and poly vinyl emulsions. Solvent bound binders are better compared to water bound binders. The later ones raise the grain or fibres off the surface. Colourants provide an equalizing tint to the wood surface and slightly colour the white extenders. Fillers, made of low opacity-reflectivity pigments serve a dual purpose, of filling as well as staining. Stains provide a correct transparent tinge to the surface. Stains are generally dye-material soluble in water, oil or solvents. Water soluble stains though of many different varieties, raise the fibres and are difficult to penetrate. Oil soluble stains are heavy bodied, take longer to dry out and interfere in the subsequent coating application. Solvent soluble stains are costly, dry out immediately and may bleed residual gums and other exudates. Stains have one important drawback that they darken the existing colour of the substrate. Where timber surfaces need to be of lighter colour, surfaces have to be bleached or toned with opaque materials. Bleaching process lightens the existing colour of the wood. It includes a treatment with hydrogen peroxide followed by an alkaline accelerator like lime, caustic soda, sodium silicate or ammonia. Bleaching affects adhesion and toughness of coating. It also provides an amber hue to the coating on aging. Staining is also done by micro spray guns, singeing, burning or carbon deposition from flames. On wood surfaces where there are very irregular grains or no patterns, these are screen-printed, pressed or embossed using stains. Such patterns may emulate a wood grain pattern or just very fine mesh or lines. Clear finishes often require some post application treatments. These are mainly burnishing and waxing. Burnishing is mainly done to NC lacquer, Acrylic and Melamine coatings, to provide a glossy surface. Burnishing is not done to slow drying coatings, because such coatings, though are dry on outer face, take days to thoroughly dry out. Burnishing is done with a Carborundum like rubbing material with a waxy or oily base. Waxing provides a dull sheen and a protective coating. Waxing is also done to renovate old coatings. Waxing compounds also include a small amount of oils and sometime silicone materials. Lacquer is a very generic term applied to a variety of coating systems. It indicates a surfacing system, where a film forming substance has been dissolved in or diluted with a solvent. On application the solvent evaporates leaving a thin film on the surface. The lacquer, on evaporation of its solvents changes the phase from Liquid to Solid, but does not convert itself into different substance. Lacquer films are soluble in the (original) solvent. Lacquers are also thermoplastic (will soften with an increase in heat) materials. The film forming substances of lacquers are linear polymers high in polymer weight with good solvent releasing property. Such substances are often very hard and brittle, so require addition of plasticizers to achieve better adhesion, flexibility and durability of the gloss. 1 Thermoplastics type: Nitro cellulose, Acrylics, Chlorinated Rubber, Vinyls, Epoxy. 2 Thermosetting type: Acrylics, Epoxy Resins, Polyurethanes, Vinyls, Alkyd, Melamine. NC Lacquers and Acrylic or Plastic Lacquers. NC Lacquers consist of Nitro cellulose as the main raw material to which a variety of plasticizer and resins are added, to provide wide range of film properties. PLASTICIZERS increase elasticity and extensibility of the film. Commonly used Plasticizers are, blown-castor oil, dibutyl phthalate, dioctyl phthalate, dibutyl sebacate, butyl stearate, chlorinated diphenyls. Additions of RESINS increase gloss and adhesion of the film. The resins are coconut and castor oil alkyds, maleic modified ester gum, cyclohexanone (ketonic) resins, acrylic resins, toluene sulphonamide formaldehyde resins. NC Lacquers are produced by dissolving or diluting lacquer and suitable plasticizers in a mix of solvents. The SOLVENTS act in three ways: Active solvents are (ethyl acetate, butyl acetate), Latent solvents (ethyl alcohol, butyl alcohol, diacetone alcohol), and Dilutents (toluene, xylene). A suitable mix of these basic three types of solvents is known as `Thinner‘. A very specific quality of Thinner is required for each application and weather condition. NC Lacquers do not become yellow with ageing. It has no peeling problem. Lacquers provide very ‘water-white’ (no colouration or tinge) film. NC Lacquers are re-coatable and removable substances. NC Lacquers are used on wood, metals, metals like gold, silver and copper, plastics, leather, paper, fabrics, as hair-fixers, and Nail-polishes. Lacquer is one of the best surface sealing material for wood products and so forms the primer coat for melamine, etc. These materials are called Lacquers because the film is ‘water-white’. Acrylic lacquers of thermoplastic type are characterized by a transparent water white film, very good resistance to decolouration from temperature and UV light, good electrical properties, outdoor durability, excellent resistance to mineral oil-greases, resistance to chemical fumes, resistance to water based alkaline substances. Acrylic lacquers convertible coating that is on drying covert to a different product, which is non-dissoluble and non-removable. These are used for: wood items, clear coating for brass, copper, and aluminium, as a top coat for final gloss and protection air-crafts, automobiles, toys, auto-parts, industrial components, consumer durables, TV cabinets. These are used as clear-invisible coating for exposed surfaces like bricks, stones and concrete. Acrylic lacquers with soluble dyes form transparent glass coatings. One of the major uses is for internal coatings of food and beverage cans. Thermosetting Acrylics provide a hard and scratch proof coating, good colour retention, better water and detergent resistance, better gloss and chalking resistance. Shellacs Finishes, were the first true clear coatings. It is believed that Shellac is in use for the past 2000 years. It was used as gum, sealing compound, and as a mastic compound. Shellac is an insect exudate known as stick-lac. It is refined to remove impurities including waxy substances, and lighten its colour. Button-Lac is a manually purified form and is of darker colour, while machine purified shellac is often de-waxed and de-colourized. Shellac is soluble in methylated spirit or alcohols. It is a very effective coating material even in very thin viscosity, as a result its penetration and filling capacity is excellent. It is one of the best surface filler material. It is eminently re-coat-able so a very smooth level and glossy surface is possible. 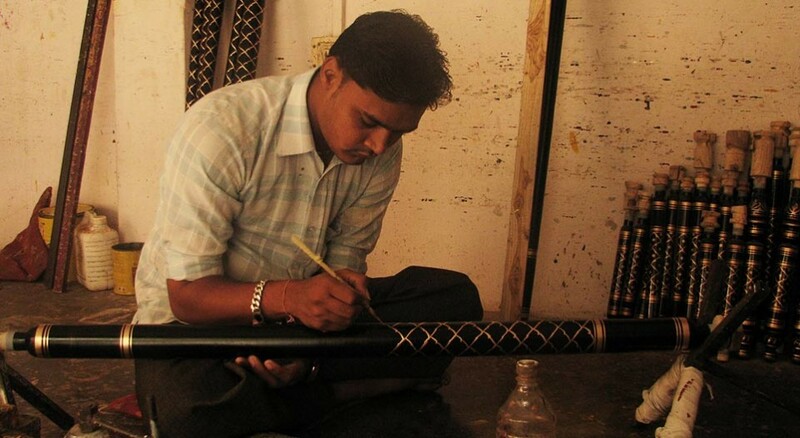 Sankheda furniture (Sankheda near Vadodara, Gujarat, India ) and Chinese lacquer items are examples of shellac coatings. French Polish has been one of the most popular clear (colourless) coating material. It has been used as wood furniture polish, Protective and glossy coating for oil paintings, besides employed as a paper coating, hair fixer, and as a gum for Gold leaf fixing. French Polish is most preferred conservation coating for old furniture and oil paintings. French Polish on drying does not convert into a non-soluble product. It is technically a non-convertible’ coating system. Once applied it can be removed with alcohol like solvent, without damaging the original surface. French polish is very similar to natural shellac polish. However resistance to wear and tear is poor, and the film is permeable. But it is re-coat-able material. French polish includes a number of materials that provide a transparent coating. In the past the most important materials were a shellac, and gum copal. But now a days various pine resins, especially maleic modified rosins of spirit soluble type are used. Varnish is clear coating of resin and solvent that dries-hardens to transparent film. Today, Varnish is a generic term for Clear Coatings that provide a colourless (transparent) and (mostly) a glossy surface. Clear Coatings are required for several reasons, such as to show-up the surface grain, colour, pattern, or protect artwork or craft pieces. The surface to be coated may not always be perfect or decent. So some form of Conditioning of the substrate surfaces is needed before application of a clear coating. The word ‘varnish’ comes from Latin ‘vernix’, meaning an odorous resin, Varnish as word comes from Greek ‘Berenice’, which was the ancient name of modern Benghazi in Libya. Perhaps the first varnishes were produced from resins of local trees of Benghazi. Varnishes are clear coatings usually made with oils, oleo-resinous substances and alkyds. Varnishes are comparatively slow drying, high bodied finishes and so can be applied by brush, unlike Lacquer or French polish. Varnish types of finishes have thicker film of high gloss, with better wear and tear resistance. Varnishes are convertible coatings (materials, which after application change into different but permanent substance), so are more stable. In the past varnishes were made by boiling linseed or tung oil with modified rosins. Later varnishes were produced from oils with maleic or phenolic modified resins. Nowadays air drying varnishes (oxidation & polymerization) are produced from long oil alkyds, where as baking varnishes (heat polymerization) are produced from medium or short oil alkyds. Often amino resins such as urea and melamine formaldehyde are added to produce a very tough, hard wearing, solvent insoluble, alkali resistant, non yellowing and non degrading film. High temperature baking varnishes though superior in many respects have limited use so far as wood, paper and such other surfaces are concerned. Theoretically any film forming medium (used for manufacturing paints -coloured coatings) can be used as a clear coating material, but certain film peculiarities and clarity restrict their use. High grade clear coatings could be of polyurethane, epoxy, polyester, PVA, materials. Varnishes besides wood, are used on paper, leather, fabrics, copper winding wires, pottery products, polymers, insides of food tin and aluminium cans, glass, electronic circuit boards, toys etc. Seating arrangements influence the nature of interaction in a group. Space planning is key to design for social interactions. Circular seating provides a better environment for interaction. A hearth has been the focus of circular arrangement. However, in a circular seating arrangement individuals interact more with the person on opposite side rather than adjacent to them. That is why when a person conducts a group, or if there is a designated leader, the circular arrangement becomes a bow. It is observed that in four-person groups (or arrangements), favourable interaction occurs among persons seated closer together rather then facing one another. This could be the reason why young couples prefer to sit at right angle, compared to seasoned couples who prefer to sit opposite to each other. It is found that when eye-contact is diffused, a side-by-side interaction is preferred to across-the-table interaction. The eye contact is diffused by distance, strong and focussed lighting below the eye levels, occlusion due to intervening objects like decorative food or flower vases. Diffusion may also happen when the opposite person is socially unknown or repugnant. Very large group meeting tables (dining, conference, etc.) are designed to be of large width or with a well. Contrary to this tables are of very small width to provide intimacy, bonhomie and revelry, such as for picnics, outdoor eateries, and reunions. Coffee houses tables are small sized to encourage intimacy. Three persons sharing a circular or triangle table is highly awkward arrangement. Similarly tables with a narrowing end create a clumsy situation unless at the wide end a leader (or presentation screen for slide show or video) holds the attention. Larry King live -the famous programme host used a table with tapered shape to position the guest (perhaps depending on the personality) at desired place and thereby control the distance of interaction. Nature of interaction is defined by the spatial distancing. The spatial distancing could be the clear distance between the seats and one that can be manipulated by posturing. Seat distances such 450 mm are intimate, over 750 to 1200 mm are personal, over 1200 to 3500 allow social or eye contact, and over 3500 mm one has control over interaction, but beyond 15 mts one needs other means of enlargement to achieve interaction. Though different cultures and contexts may elicit alternative expectations on distance of interaction. The concept of spatial distancing and interaction have different connotations. Chat rooms, bulletin boards email, twitter and Skype etc. allow communication among strangers. Some of these mediums miss the personal feedback or a face-to-face context. Every media set has its own defined or expected culture, and anyone who do not abide by it is considered violating the spatial relationships. The person is considered less sociable than those who do not commit such violations.